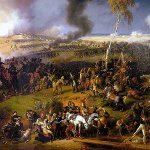 Day of the Battle of Borodino is one of the Days of Military Honor in the Russian Federation. This day commemorates the major engagement, that was fought on September 7 during the Napoleonic Wars. The Battle of Borodino was fought on September 7, 1812 near the village Borodino. The fight involved around 250,000 troops involving at least 70,000 causalities. This battle was the deadliest event of the Napoleonic Wars. The outcome of the battle was uncertain for every belligerents. The French soldiers didn't known about the condition of the Russian Army and couldn't defeat it. And the Russian Army had to retreat, that was strategically important. However, this battle stopped the French advance on Moscow and ultimately resulted in the defeat of the French invasion. Napoleon I and Field Marshal Mikhail Kutuzov paid much attention to the battle, calling it the worst one during their lives. The historians regard this battle to be one of the bloodiest in the 19th century, when about 8,500 soldiers were dying on the field every hour.